Comprehensive review of Murad Skin Perfecting Lotion. See how this retinol cream compares against other wrinkle creams! We’re not exactly sure what Murad Skin Perfecting Lotion is supposed to be. It’s listed at Sephora as a “retinol cream” but on Murad’s website it’s listed as an acne treatment and moisturizer. That’s odd, but since this is a site about retinol, that’s how we’re going to review it. 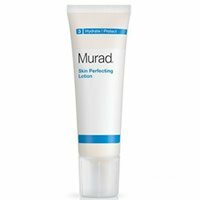 Murad Skin Perfecting Lotion doesn’t seem typical of most retinol products we’ve tried. First, it was much thinner then what you would expect. Also, most retinol creams give you a percentage as to how much of it is in the product. This one made no mention of it. Overall, this product doesn’t seem like a true retinol treatment, and doesn’t perform like one either. I feel as if it’s a hybrid between a daily moisturizer and a “wannabe” reparative or acne cream. So if you’re looking for a true retinol product I wouldn’t recommend this. However, if you’re looking for something extremely mild that’s an upgrade from your generic drugstore moisturizer, then this may be a decent product to start with. Murad Skin Perfecting Lotion is a white colored lotion. Compared to most retinol creams, this one is pretty light in texture. It feels “thinner” than the vast majority of retinol based products. Applying the product is very simple, especially since it’s so lightweight. I found this odd because you’re supposed to use retinol creams at night as sunlight deactivates the retinol molecule. Honestly, I’m not sure why they’re suggesting you use it during the day. The smell is pretty faint, but isn’t noticeable once you’ve applied it to your skin and allowed it to dry. There’s no real fragrance put into the formula. Waking up the next morning after using the Murad product I didn’t notice any real changes, good or bad. My skin never burned or had that immediate tingling sensation that many of these lotions can cause and there was no redness or irritation. However, I didn’t notice any positive changes either. My skin felt a bit softer and smoother, as it would feel after sleeping with any overnight moisturizer. Longer term I noticed little change to my skin. My skin maintained a healthy glow, and was slightly smoother, but overall no real changes occurred. This product has retinol in it, but the percentage is not listed anywhere I could find. It also claims to have queen of meadow extract, which supposedly has anti-septic and anti-inflammatory properties. I’m not sure about that but at least it’s unique! Finally, I saw that arnica is included in the formula. That’s been used for years to help soothe the skin. Murad Skin Perfecting Lotion costs $35 for a 1.7 ounce bottle. That works out to $20.58 per ounce, which isn’t too bad compared to other retinol creams. However, any price is too much if the product doesn’t work well! If you’re not happy with the product Murad will give you a full refund up to 60 days from the ship date (even if the bottle is empty). To buy Murad Skin Perfecting Lotion, click here.